Is it time for her to soar high above the city, battling bad guys and beating up bullies? Is she ready to become a crime fighter extraordinaire, and a renowned vigilante? Is she ready to become the Batgirl? The ultimate superhero lady of Gotham City? You're right. Maybe that's a pretty tall order for her age. But. There's still a way we can get her a little piece of the super hero action without her having to go on vigilante duty. She can look sweet, capable, and ready to save the day... even if she's just a super hero in training. Well, there is, and in fact, it's pretty simple. 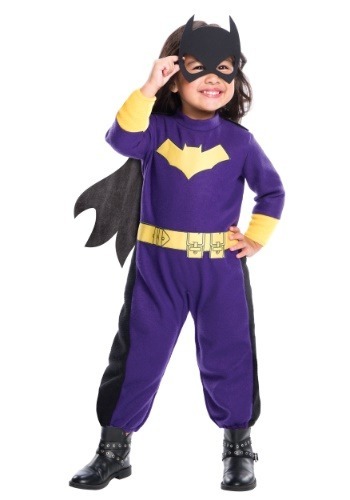 All we have to do is get her this girl's Batgirl romper! This sweet suit is a toddler's romper, but it has all the styling of a Batgirl outfit, too, to make it so your little kiddo can feel like an official superhero. Sewn on details like the Bat shield and a utility belt give it all the costume style it needs, plus it has a removable cape, and even an eye mask to help conceal her true identity! With signature costume details, she'll be ready for action on the streets of Gotham City. But since it's still a romper, she might be more inclined to detach the cape, take off the mask, and take a nap. That's okay too! She is, after all, a superhero in training. And she's going to need to grow up to be big and strong to save the day!